It was supposed to be a time of rejoicing, a time of rest, yet it turned out to be anything but that for the Knights Templar 3, as Roftie attacks. Roftie is a name that strikes fear in the hearts of many within the ranks of the Knights Templar. This warrior has been a thorn in their sides for as long as anyone can remember. Many times throughout his history as a Lord he has drawn the Knights Templar into conflict, especially KT3. A prime example of this was during his time with Destiny, and how KT3 and the former league nearly entered into a full blown war over the actions of this one player. Even after leaving and forming his own "one man army" with the league named after himself, "Roftie," the conflict didn't end there, nor did his tendency to cause grief to members of the Knights Templar. KT3, as previously mentioned, has been one league in particular that has become the focus of Roftie's attention and thus his massive armies that he uses recklessly to destroy his many enemies. Unfortunately for both parties, this is the focus of this week's edition of the Chronicles. Many over the holidays were enjoying themselves, taking some much deserved rest with their friends and families, this included those within the Knights Templar 3, yet it was not meant to be. Striking out and launching a full blown offensive, Roftie attacked and sacked beacon after beacon, single-handedly crushing ALL of the KT3's beacons the night before Christmas eve. 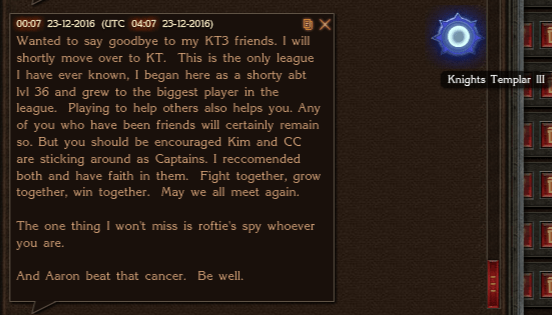 Disheartened and discouraged, many members within the KT3 woke up to the following dismissal message from their Marshal. 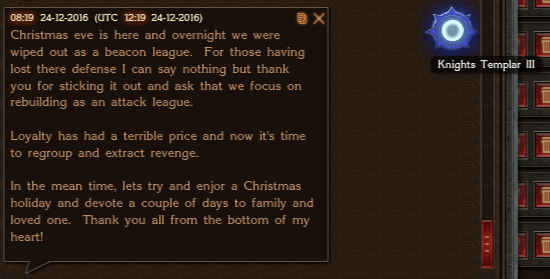 Following this message and the attacks that resulted in KT3 being completely expelled from their lands, morale has been at an all time low within KT3 and that fact has become blatantly obvious to anyone that has taken notice, with numerous high-ranking members and Captains deciding it better to move on for greener pastures. It must be noted that it is being reported that the Knights Templar were not at a total loss during this onslaught, as it has been stated (though not confirmed) that the Marshal within the Knights Templar main league was able to catch Roftie’s offensive armies off-guard, slaughtering and crushing them in the process. Still, as of writing, the KT3 are still without beacons and are now nomads within the realm, rebuilding their forces and hoping for better days.